Despite having being built this side of the millenium, La Merced del Alto gives off the impression of a Spanish hacienda that has been around since colonial times, with its adobe walls and high ceilings made from carob wood and cane. There are 14 palatial rooms all adorned with hand woven textiles and ornaments made from horn. Views are stunning and look out to the cactus lined ridges, the gardens or the olive trees. The hotel is surrounded by nothing but Argentine landscape, so views are the hotel's thing. Settle down in the sitting rooms for an incredible vista of Nevado de Cachi's snowcapped peak, that is 6,380-metres high. Calchaquí influence is apparent throughout the hotel, including the restaurant. Local chefs create delicious delights typical of Andean food, for example llama, quinoa and maize. The hotel also produces its own label of Malbec. Facilities at the hotel include an outdoor heated pool, a spa, Jacuzzi and solarium. Outside of the hotel, guests can get involved in the Calchaquí culture, with visits to weaver's workshops and searching for ancient pottery fragments in ruined Diaguita citadels. 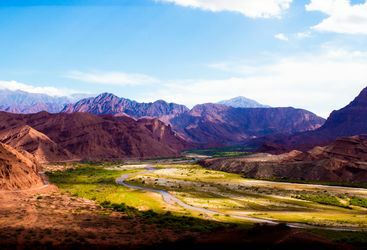 Also tour the high altitude vineyards around Cafayate or drive through the impressive landscape which draws comparisons with Arizona's Painted Desert as it is every bit as wild and dramatic. Ollie and Kate B are our 'La Merced del Alto' experts and as seasoned travellers they have the inside track on the most memorable adventures.